In seeking out something new and interesting to do with spaghetti squash, I quickly found inspiration from a recipe on Kayln's Kitchen. 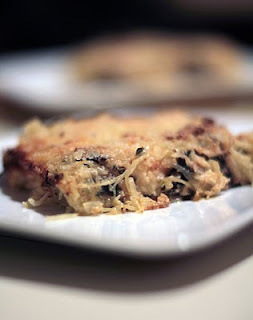 I never would have thought to combine spaghetti squash and Swiss chard! I had to adapt her recipe given the ingredients I happened to have on hand and I think it's fair to say it was a fun and delicious combination. Cut off the stem and blossom end of the squash, then carefully cut in half lengthwise. Scrape out seeds and the slimy material that surrounds them and discard. Rub cut sides of squash with about 1/2 tablespoon extra virgin olive oil for each half and sprinkle each with dried sage and thyme. Line a rimmed baking sheet with foil and place the squash cut side down on the baking sheet. Pour 1/4 cup water around bottom of squash. Roast squash about 45-50 minutes or until it separates easy into strands when pulled with a fork. Let squash cool for a few minutes, then shred into spaghetti-like strands. Heat 1 Tablespoon extra virgin olive oil in heavy frying pan, add chopped onions, salt and pepper to taste, and saute until onion is translucent. Add minced garlic and cook about 1 minute more, then add chopped chard. Cook chard until it's wilted to about half the size it was. (The chard shouldn't be completely cooked, since it will cook more in the gratin.) Turn off heat. In a bowl mix together the beaten egg and smoked gruyere, salt and pepper. Set aside. Using a large fork, gently mix the shredded spaghetti squash into the onion/chard mixture. Pour on the egg and cheese mixture. Put the combined ingredients into a baking dish. Sprinkle top with Panko bread crumbs and 1/4 cup Parmesan cheese. Bake about 30-35 minutes, or until the mixture is bubbling and cheese is browned on top. Okay, so I admit my adaptation of this recipe isn't exactly low calorie with all the cheese and cream. Everything in moderation, right? It was nice to indulge a little and since the husband gave it a thumbs up I'll definitely be making it again soon. Yum! This look fabulous... I can't resist greens and cream. I just can't!